SPECIAL DEAL: Save $600 when you register today. Only 2 seat left! You’ll explore one of the most exotic countries on Earth… while learning to “see” light and manipulate your camera… edit your images on your computer… and create fine art and stock images you can sell! And do it all in the company of two professional photographers, ready to share their hard-won secrets and insights for creating photos you can sell for $50, $150, $500 – and more… again and again. Note: Unique opportunity – limited to 12 guests only and only 2 seats left! Physical requirements may apply. Joining us halfway across the planet in one of the most exotic landscapes in the world is one of the most FUN! Namibia is like nothing you’ve ever seen before. Towering red sand dunes, quiver trees that don’t exist anywhere else, canyons that rival the beauty and splendor of our own Grand Canyon, and more! But the opportunity to go before it’s overrun with tourists is about to expire. So we must go now to see it in its rawest of states. The signs of progress are on their way and my friends on the ground tell me they’re amping up for big advertising to draw more tourists soon. Yet it’s still largely untouched. 40% of the country is protected by the country’s national park system or private reserves. So that’s 52,000 square miles, including almost 1,000 miles of coastline, just waiting for us to take away memories and stunning photography. So vast. So beautiful. I bet you’ll cry. Watching the sun rise and fall over the Namib Desert has been one of my all-time favorite life experiences. It’s so incredibly beautiful that it feels as if you shouldn’t be allowed to see it. And it’s so incredibly vast, you can’t help but feel small. It’s a visual feast, and, as soon as you see it, you’ll fall in love. You’ll get dusty playing in the sand. And if you want to climb to the top of the dunes, you’ll need to practice at home climbing stairs before you leave. But these landscapes are straight out of a National Geographic special even when you don’t climb to the top… and our accommodations are top notch… so the time to go is now before the crowds! People think of Africa as all one place, but it couldn’t be more different from one country to the next—in the same way New York is unlike Texas and Paris is unlike Barcelona. We’ve incorporated an animal encounter into our itinerary but the real draw in this country is its jaw-dropping scenes—from dunes to petrified trees. Fly into Windhoek’s International Hosea Kutako Airport (WDH) where you’ll meet your guide and our group. Windhoek is a big city complete with Babies R Us and Forever 21. Lots of people think Africa is full of tribes and mud huts—and it’s true Namibia has hundreds of unique and culturally diverse tribes—but it’s also overrun with Germans. 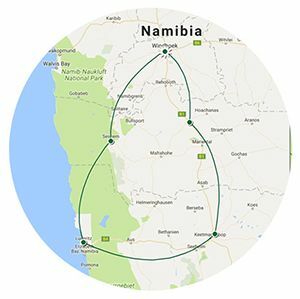 Windhoek is a city much like one you’d find here in the U.S.
After landing in Windhoek, we’ll make our way south to the Kalahari Desert, traveling through small towns along the way. After lunch and settling in to our lodge, we’ll head out on an exploration of the Kalahari dunes, taking in the nature and scenery along the way. End the day with sundowners on the deck and then dinner together as a group in the lodge before heading to your room to rest. Quiver trees (or kokerboom) are a Namibian icon—tall, with thick round trunks topped by spiny branches, once used by Bushmen as spines for hunting. Both the Quiver Tree Forest and the Giant’s Playground form eerie silhouettes during the blue hour and their surfaces take on a warm hue during the golden hour, creating unique opportunities to practice twilight photography. Watching for wild desert horses and taking in the landscape along the way, today we’ll journey to Luderitz, a harbor town at the intersection of the ocean, the desert, and Namibia’s now-abandoned original diamond country. 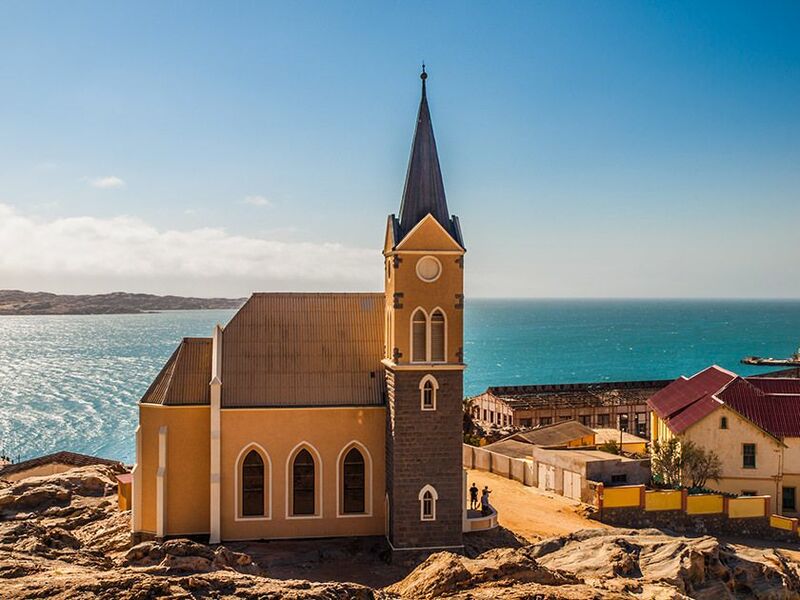 In this worthy stop on the way to Kolmanskop, you’ll find colorful European Art Nouveau buildings that pop straight out of the dirt against a surreal backdrop of rock cliffs, palm trees, and jewel-colored waters. With bakeries, cafés, and churches resembling a small traditional German town, you can explore and dine here as if you were in a European village 100 years ago. This morning we’ll rise early to catch the sunrise over Namibia’s most famous ghost town and the desert dunes that engulf it. Until 2008, this area was forbidden to visitors. We’ll embark on a guided tour of the eerie forgotten town, where in 1908, a railway worker found a sparkling stone… and discovered diamonds. Shortly followed by a diamond rush, a bustling traditional German town sprung up around the mining trade, with a hospital, playgrounds and a swimming pool, bakeries, butcheries, furniture shops, and even a bowling alley. The newly rich German inhabitants created a lively town in isolation here, filling it with grand mansions and plenty of entertainment and culture. By the 1930s, the mines had waned, and, when the 1950s rolled around, the struggling town was abandoned for richer mines in the south. Many of the inhabitants simply left their homes and belongings behind. 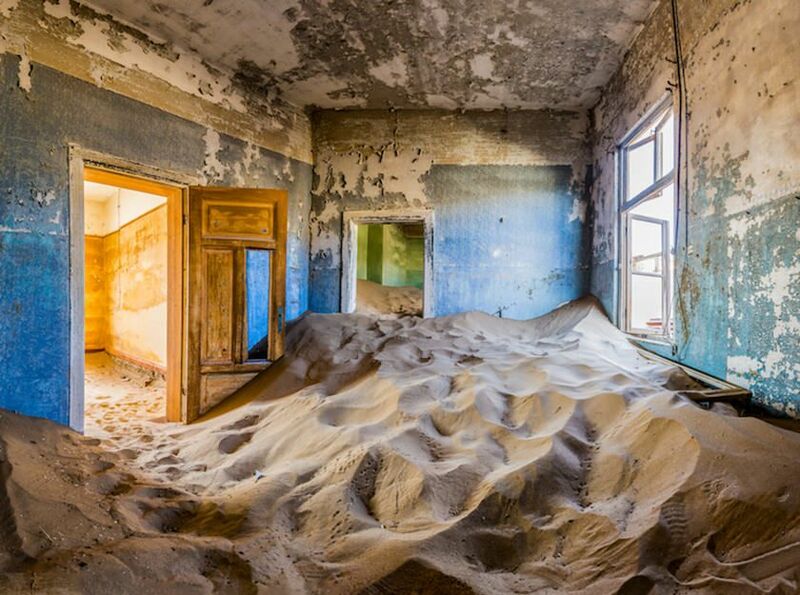 A photographer’s paradise, here waist-high dunes tumble from one room to the next. Fingers of light reach in from bare windows, door-less entryways, and the spaces between weathered wooden slats. Wind in the rafters whispers stories of fortunes made and lost. Outside, a cloudless blue sky, ever-present sun, and lack of rain have washed all color from brick facades. This morning will begin an entirely new day of discovery as we leave Luderitz for the NamibRand Nature Reserve, passing through the Namib Desert, where we’ll keep an eye out for wild horses and take in the breathtaking scenery of the Tiras Mountain Conservancy. 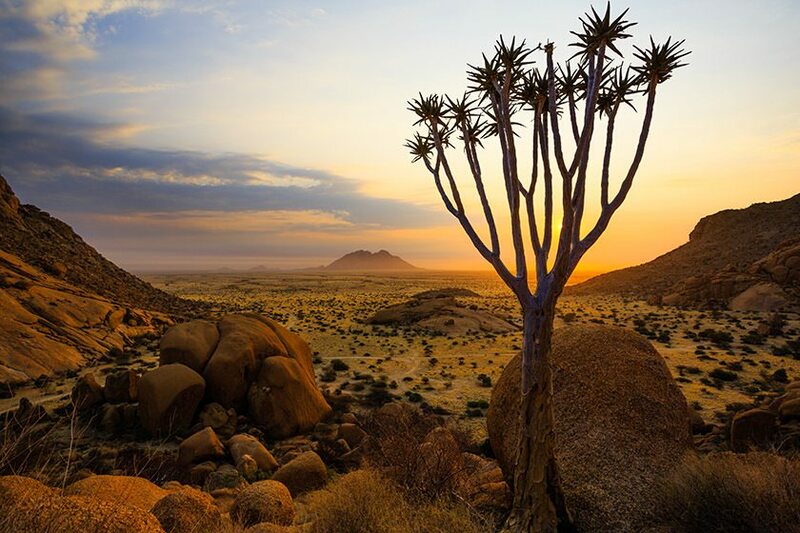 In this, one of the most picturesque regions of the country, you’ll experience the splendors of three different desert ecosystems with the chance to see roaming mountain zebra, kudu, springbok, ostrich, oryx, caracal, hyena and jackal, among other wonders of nature. It’s here, at the Kanaan Desert Retreat, that you’ll have the once-in-a-lifetime opportunity to walk alongside, feed, and photograph the fastest mammal on earth—the cheetah. We’ll spend a day taking in the splendid landscape here, embarking on an early morning safari drive in the world’s oldest desert. We’ll watch for leopards, hyenas, cheetahs, along with a myriad of smaller animals that make up the web of life in the desert. In the evenings, we’ll take advantage of the stunning night sky—completely free from light pollution —and try our hand at astral photography, catching constellations and the milky way over the strange landscape of dunes and trees. This morning we’ll take off for the land of soaring red dunes at Namib Naukluft National Park. We’ll have the rare opportunity to stay at Sossus Dune Lodge. As the only accommodations inside the national park, this special lodge is booked out year-round. Staying here gives us a unique advantage when we get up early to see the sunrise over the highest dunes. Deep red dunes, seemingly dry riverbeds fed by underground rivers, desert grasslands, and mountain outcrops punctuate the horizon, here. Defying the desert environment, don’t be surprised if you see gemsbok, springbok, zebras, kudu, klipspringers, spotted hyenas, jackals, and fox. The next two days will be some of the most spectacular photo-taking, scenic days you’ll experience anywhere. At times you may wonder if you’re standing in the middle of an abstract painting. With our unique position in the park, we’ll be able to get into Sossusvlei, the area with the tallest dunes, before anyone else… giving us the opportunity to climb up to the top of the tallest dunes for sunrise. We’ll watch and photograph the changing colors and shapes of the sculpted sand ridges and soft valleys below. 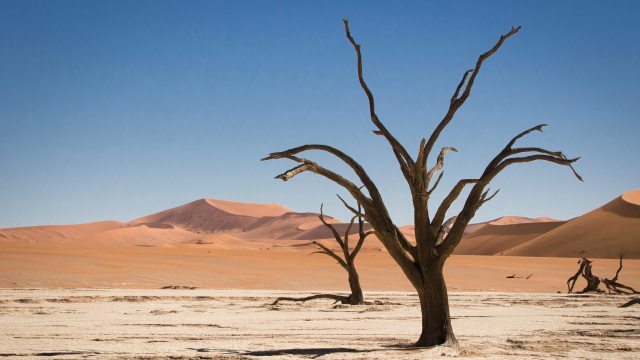 Next, we’ll head to the cracked-mud pan of Deadvlei, with its eerie camel thorn trees. Standing for the last 800 years, these trees survived until about 100 years ago, when they died and slowly turned black, scorched from the sun. These days will be some of our best, filled with exploration, photography, picnic lunches in the desert, and sundowners back at the lodge. Beginning our journey back towards Windhoek, today we’ll pass through the Great Escarpment and the scenic Khomas Hochland Highlands, stopping for photos and a picnic along the way. Arriving at our lodge, we’ll take some time to relax, share our experiences, and talk about our photos in our last few review and lesson sessions. We’ll be a mere few minutes from the heart of Windhoek here, so you’ll have the chance to do your last shopping and dining in Namibia before taking off tomorrow. You will see the huge improvements you’ve made in your skills as you look back over your photos from the trip and choose a few to print or sell when you get home. It may feel like this amazing journey is coming to an end, but, in truth, it’s just the beginning of a whole slew of opportunities ahead. This morning, after a nice breakfast with the group, we’ll transport you back to the airport for your journey home… or you can continue your travels on your own. Cheryl Bigman came to Great Escape as an attendee at our first Paris photography expedition about 10 years ago. She had always loved creativity and expression, but back then, she had no idea photography could become a career. During her time in Paris, she found her calling in capturing candid, un-posed moments that tell a story. Since then, Cheryl has spun her love for photography into a full-time, six-figure career that she loves. While she specializes in family portraits and event photography, including weddings and Bar & Bat Mitzvahs, she also enjoys taking time to shoot personal work for herself, including fine art and her daughter’s ice hockey games. Cheryl has also freelanced as a photojournalist. Her work has appeared in her hometown magazine and other local publications. She is the staff photographer for two non-profit organizations and regularly donates her services to help raise funds for the schools in her area. As a successful self-taught photographer and business owner, Cheryl knows exactly what to do – and what NOT to do to make an income with your craft. With loads of “in the trenches” knowledge to share, she’s very excited to join us again in the role of instructor. She’ll walk you through her own processes, step-by-step, so you, too, can compose eye-catching photos that can sell. 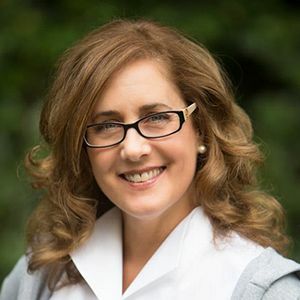 Cheryl specializes in selling her photos directly to clients, but the same principles she uses in that market can be applied to editorial, stock, fine art, and more. Namibia is a boutique safari destination in Africa. Camps and lodges are small so that they can attract luxury clientele who want privacy away from crowds. Some of these camps are located on private property, which means we get exclusive access to many of the landscapes and attractions we’ll visit… and we’ll have a more intimate experience overall. If you agree to share your room on this trip with another attendee, we can save you a small fortune on your fee. This part of Africa offers some of the most expensive expeditions in the world, so the best way to cut costs is to double-up. There are no other tours of this caliber on offer today. This is because we have friends on the ground who told us about opportunities travel agents don’t know about and we scouted them ahead of time to find the best view points for photography and experience. Most people don’t know this but February is THE best time to go, too. It’s our best shot for fluffy white clouds. Other tours will take you on a tourist path where you may or may not get the best photos. 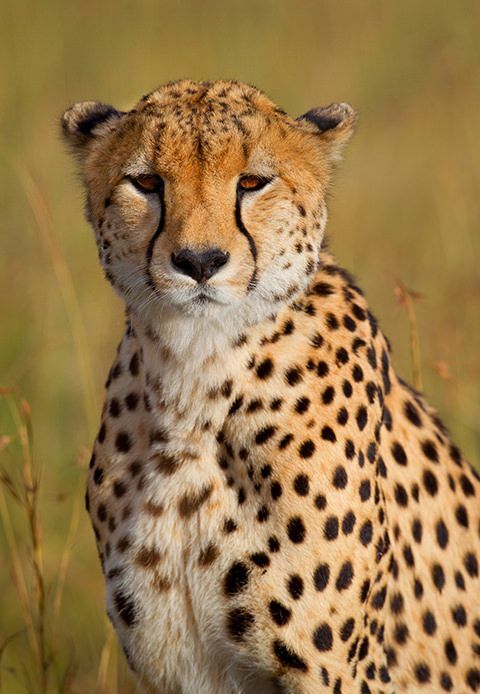 This expedition is designed with photography in mind with the added benefit of a cheetah to model for us in the sand. Other tours will charge at upwards of $17,000. They’ll add on days and have you in the car way more often then you’re out of it. You’ll get sub-par accommodations and honestly, you’ll just be so happy to see your bed you probably won’t even care. But not on this trip! We eliminated A LOT of driving and will not waste your time in un-photogenic areas or set-up-for-tourists spots. We shaved $5,000 off the cost of our tour and you’ll save even more if you agree to double up and share a room with another participant. luxury tent with another participant! … and take an additional $600 off when you register today. You won’t find a trip and instruction of this caliber, for this price ANYWHERE! Note: Additional discounts may apply. You can click through to the registration form at the link below to learn more. Easy Payment Plan: What’s more, if you’d like to take advantage of our easy payment plan, you can register today for just $1,739 down. Reserve a seat on the expedition for just $1,739 when you put your name on our attendee list today. We’ll bill your credit card $1,739 today, and 4 equal monthly payments thereafter. So you spread out the payments comfortably over 5 months between now and when the workshop starts in February. If you are a U.S. citizen, you’ll pick up a VISA at your port of entry into Namibia, which is valid for 90 days. If you’re not from the U.S., check with the Namibian consulate for your country for details. Money: The currency in Namibia is the Namibian Dollar, which is currently about .075 to the U.S. Dollar. You can get it out of the ATM when you arrive in Windhoek, or you can use South African Rand, which is widely accepted, too. Electrical: Namibia uses both the South African 3-prong “Type D” plug and the European-style two-prong “Type E” plug (and possibly a converter). Almost all laptops and camera battery chargers have an electricity converter built in to the power cord (that means you don’t need a converter). For these things, you simply need an ADAPTER plug, which you can usually find at Target, Best Buy, Radio Shack, or Circuit City. Though we’ll be driving across the many varied landscapes of Namibia, we’ll also spend time walking and even climbing up a huge sand dune before sunrise. You should be comfortable walking on sand and uneven ground, carrying your camera, tripod, and possibly a backpack. We could possibly walk between 2 and 5 miles per day. If you’re unable to keep up with the group, you may be asked to sit out of an activity. If you have concerns about physical limitations, please contact a Great Escape Publishing staff member before registering. You can email us at workshops@greatescapepublishing.com or call (561) 860-8266. Cheryl may be an expert photographer today but they started out right where you are now—as an amateur with a love of photography and a need to make an income doing something fulfilling. This workshop is a once-in-a-lifetime opportunity for folks who truly want to get paid to travel. 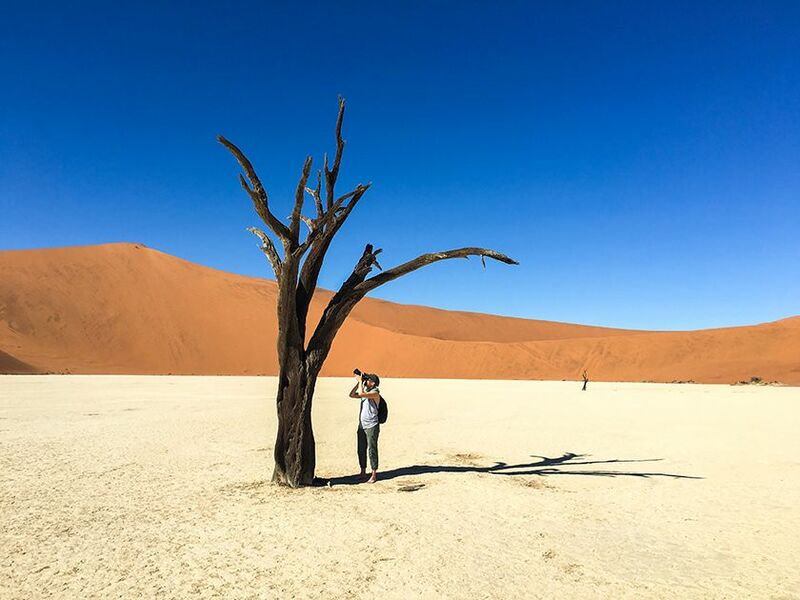 Not only will it include loads of exploring the eerie and fascinating country of Namibia, but you’ll have the opportunity to sit down with Cheryl to go over the photos you’re taking and learn how to improve. You’ll get in-the-field guidance and loads of help with your camera settings, too. 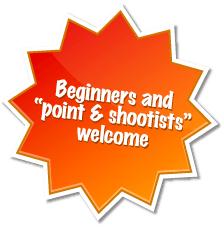 You’ll learn a LOT in 10 days, and go home with some amazing shots. Again, there are only 2 seats available. I strongly urge you to sign up today. So please, register here now by clicking below or if you have any questions call our office today at (561) 860-8266 (Eastern time zone). You can also email me at lori@greatescapepublishing.com. Cancellation Policy: All our workshops and expeditions are non-refundable. If, however, you are unable to attend due to unforeseen circumstances – and you give us at least 60 days’ notice – we’ll be happy to apply your payment toward a future workshop, minus a $500 processing fee. If you cancel due to reasons that are covered by your purchased travel-insurance policy, we will advise the insurance company that your travel and conference fees are non-refundable.